There were certainly many fabulous quilts at the Pacific International Quilt Festival a couple of weeks ago. To my eyes, one of the very most striking entries was “Remembering Barbaro” by Sheril Drummond of Lexington, Kentucky. My husband and I were following Barbaro’s story as well. Before I loved dogs I loved horses, and still do, so you can see why this quilt grabbed my eyes as I came around the corner at the show. I contacted Sheril and she graciously permitted me to shine a spotlight on her piece, and to tell a little bit about her and her work. Sheril has been quilting for about 20 years now. When she moved from northern California to Kentucky, she joined a Newcomers group, which led to a quilting group, need we say more? Sheril says that after she learned the basics she found she was not content with traditional quilting and felt moved to produce her own designs. Her latest technique is a stained glass effect, beautifully evidenced in Barbaro. To create her pattern, Sheril draws a basic shape, then divides it into sections with lights and darks in mind. The sections are fused onto a background, and the edges are finished with a machine blanket stitch. Sheril uses a variety of fabrics, some commercial, some hand-dyed, to wonderful effect, don’t you think? In the last four years Sheril has been entering her work in some of the larger shows, and has had pieces accepted into Quilt Festival in Houston, the AQS show in Paducah, the Mid-Atlantic Quilt Festival, and Quilt Expo in Nashville. You can see more of Sheril’s stained-glass art quilts on her Serendipity blog. Sheril is thinking of publishing her patterns in the future. She currently teaches her methods in an all-day workshop; contact her at “shedrum at surfbest.net” if you’re in a group that would be interested. Here are some students working in a class with Sheril. She’s the one sitting down on the right. Thank you, Sheril for remembering Barbaro, and for creating these wonderful works of art. Judy Severson once gave a lecture at my quilt guild, where she showed us glorious examples of the broderie perse method of appliqué that she is so wonderful at. She told us that one of the secrets for success is to find a perfect match in the color of the background fabric that you’re going to use and the background of the printed motifs that you’re going to cut out. Here’s a link to a photo tutorial on the HGTV website that is based on her Simply Quilts episode. Here’s her book, available on Amazon. This is a mite off-topic, but it occurred to me after I wrote the post about Free Flowers that it might seem a bit odd that I talk about keeping the dog from walking over my project. Maybe you were picturing a big wiggly golden retriever clambering up on my sewing table? 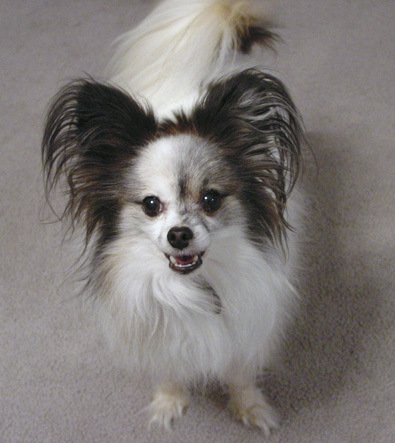 No, Willie the real quilt puppy is a papillon, who weighs 7 pounds and is about the size of a cat. He is very nimble and a great jumper. He leaps up onto the chair and thence to the table with lightning speed. From there his destination is the windowsill, where he looks out over his domain (the neighborhood courtyard). 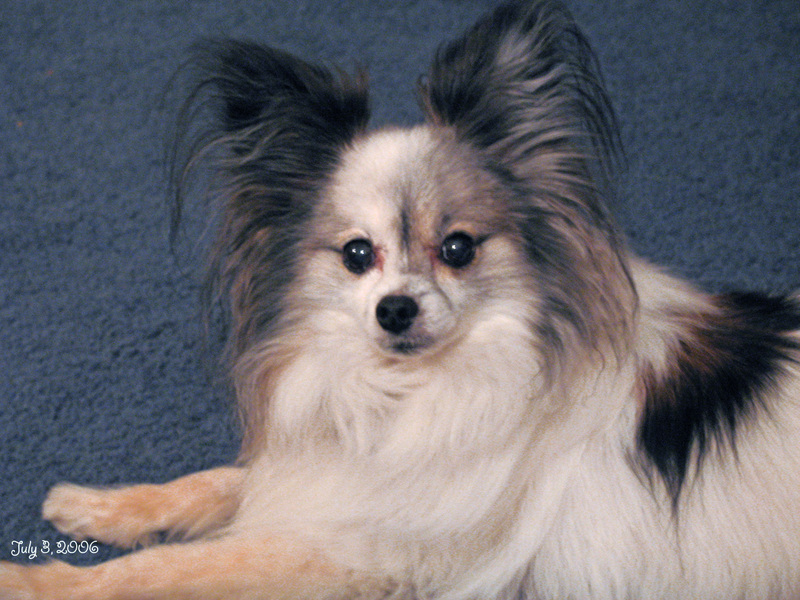 Willie is 13 years old now. Here’s picture of him taken when he was 12. His head has gone gray but the sable coloration on his back is still vivid red-brown and black. You have treat for me?? Here’s Willie approving the cover quilt for my first book, Dog Cabin. 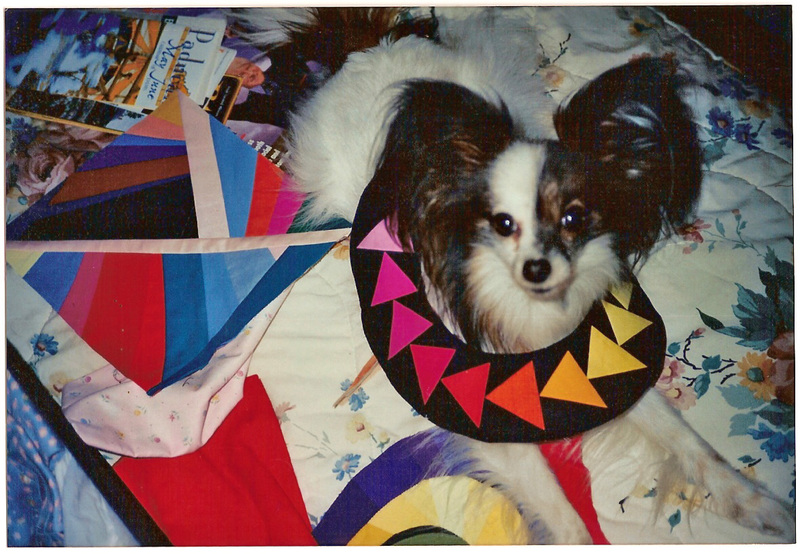 Willie at a younger age, helping me unpack after a workshop with Caryl Bryer Fallert. So that’s the quilt puppy, who walks over my projects and the extension table of my sewing machine, lies on my quilts while I’m trying to quilt them. sleeps in a tub of fabric by the window, and otherwise offers dog help and boon companionship. I found a nice photo tutorial on Liesl Gibson’s Disdressed blog, showing the ladder stitch for hand appliqué. I’ve never used this stitching method, and I learned something. I’ll be trying it out. Thank you, Liesl! A couple of months ago, I set out to make an appliqué project where I would challenge myself in two ways. I would use no pattern, and I would finish no edges. Both of these precepts were new territory for me. Ever the one to follow the pattern was I, in the last few years particularly so that the samples I made would represent the patterns I created. And, I’ve always been a “neat and pretty” girl, turning the edges when working by hand, or finishing the edges with a buttonhole stitch for machine appliqué. Now I wanted to shake off those constraints and make an improvisational piece. I selected a stack of fabrics and ironed paper-backed fusible web to chunks of them in advance. (If you’re wondering, I’ve found that regular Wonder Under works the best for me.) I got a piece of black fabric to use for the base. I put this on my table and stood over it, scissor-cutting freeform flowers, stems, and leaves. At last the shapes were packed as densely as I wanted and everything was in place. I removed the paper backing from all of the shapes and fused the entire project. Now, since the second part of my personal challenge was to finish no edges, I was ready to skip straight to the layering and quilting stage! I had read about how quilters “finish” the edges of their motifs during the quilting process by quilting close to the edge, and I had seen this many times in quilt shows, but I had always considered myself allergic to the idea. This was my chance to try it for myself. Here is the result of my personal twofold challenge: Free Flowers. When I showed this to my quilting friends they could hardly believe that it came from me, so different it was from my usual style. I’m so happy with the result of my challenge to myself! As Laura Wasilowski advises, use fabrics for fusing where the color goes all the way through. Avoid fabrics with whitish or sketchy-looking backs. Use densely woven fabrics. Avoid fabrics that are woven from heavy/ravelly threads. Be prepared to relax a little bit about raveling around the edges. Since I chose a few fabrics that were contrary to the above recommendations, I spent awhile giving my quilt a shave and a haircut with a sharp little pair of scissors. If you know how to preclude raveling altogether, please let us all know. Black backgrounds, especially batik, attract cat hair with a strong magnetic force. I would try this again, and choose my fabrics better. I really am a little allergic to fraying edges. I highly recommend setting a personal challenge for yourself! I just got home from four days at the Pacific International Quilt Festival… whew! I had THE most fabulous time. Talk about appliqué… there was something astonishing around every corner. In addition to an entire universe of quilts, I saw everybody I knew, made new friends, and met some renowned designers. I’ll start with a quick introduction to Joanna Figueroa, the creative force behind Fig Tree Quilts. Joanna has some absolutely charming appliqué designs in her appealing “fresh vintage” style, so be sure to visit her web site. More on Joanna later, as well as some spotlights on other talented appliqué designers and artists that I met at PIQF. My appliqué friend Pam Crooks is a member of the American Quilt Study Group (AQSG), a national organization devoted to quilt-related studies, especially the history of quilts, the women and men who made them, and the fabrics they used. A couple of nights ago, Pam spread her AQSG study quilt out on the floor for show and tell. Oooh! photo tutorial), and hand-appliquéd them in place. The completed study quilts tour for two years to various quilt shows and museums. For more information on the AQSG, please visit their site. Pam is an appliqué artiste extraordinaire, oui? One more quilt from “the article” (see previous two posts). This one had its own sidebar! I made this quilted sign to hang in my sewing room, thereby elevating its status to a “studio.” If you make a sign for your sewing room it can be a studio too! To form the letters, I made bias tape with my trusty green gadget, the original Clover® ¼” bias tape maker. Then I used the fusible strip that comes on a roll, except I cut it in half lengthwise to make a very thin strip applied to the center of the bias tape only. That keeps things more flexible. A fat eighth of fabric formed the backdrop as I played with the arrangement of the letters, sticking pins straight down into them to hold them until I was happy with how they looked. Then I fused them in place. I put tearaway stabilizer behind, and topstitched the letters on both sides. After removing the stabilizer, I added the strippy borders and machine-quilted the sign. Then I got into my button box and tied buttons through the quilt over all of the raw edges of the letters, and now it looks like a quirky typeface! Bias tape letters are informal, folksy, and fun. Save this technique for a project where the letters are meant to be tall and skinny, because the wider the strips the less flexible they are. This cutie was also made for the “Ways With Words” article (see previous post). In the article there are some notes about using Ultrasuede for making letters, but there wasn’t room for a photo example, so the quilt didn’t make it into the article. It’s called “Peek A Boo” (as distinguished from my “Peekaboo” quilt pattern, which was named for a traditional quilt block). The shy bear was needle-turned and then hand-buttonhole-stitched around the edges. For the letters in his sign, I used fusible web, being careful not to smash down the texture of the ultrasuede when fusing. Ultrasuede is a slightly fluffy synthetic material that doesn’t ravel, so you don’t have to finish the edges. I used some embroidery floss in a running stitch to embellish the letters and to hold them in place permanently. The frame and post of the sign are also ultrasuede, which I machine-buttonhole-stitched. So, quite a mixture of techniques from my appliqué bag of tricks for this little quilt! P.S. I got the ultrasuede scraps inexpensively on ebay. P.P.S. 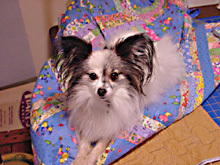 If you’d like to see the other Peekaboo, you are invited to visit my patterns page at Quilt Puppy.